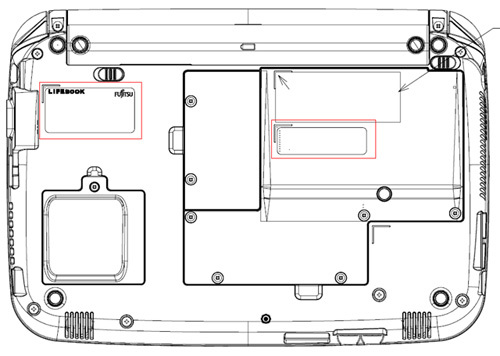 Previously we mentioned about Lenovo IdeaPad FL5-B3 as the first Intel Atom Pineview nettop, now seems that Fujitsu new netbook machine has been spotted at FCC filing, indicating that more and more Pineview Atom based netbook is on the way. Named as MH380 and M380, the netbook will be categorized under its famous LifeBook family suitable for general web surfing, office applications and other tasks. The new machine will be powered by Intel Atom Pineview processor running at 1.66GHz. If you recall, Intel Pineview has been officially renamed as N450 that is supposed to be a new replacement of existing N-series targeted for much CPU and graphics intensive applications. Although not many information being disclosed yet, there is confirmation that a 802.11n Wi-Fi module will be integrated for seamless network connectivity, on top of normal Ethernet RTL8103EL-GR 10/100 Controller solution from RealTek. Besides, it will also be equipped with standard 10.1-inch LCD display with FWXGA 1366 X 768 resolutions. In terms of physical form factor, the LifeBook has a slightly rounded-edge design with ample space catering for future system upgrade whenever necessarily. No pricing information and exact availability yet, the Fujitsu LifeBook is expected to reach commercial market soon. Since it is still categorized under pre-production sample, the specification may slightly vary or change but likelihood for this to happen is low due to resubmission for FCC is quite time and effort consuming.